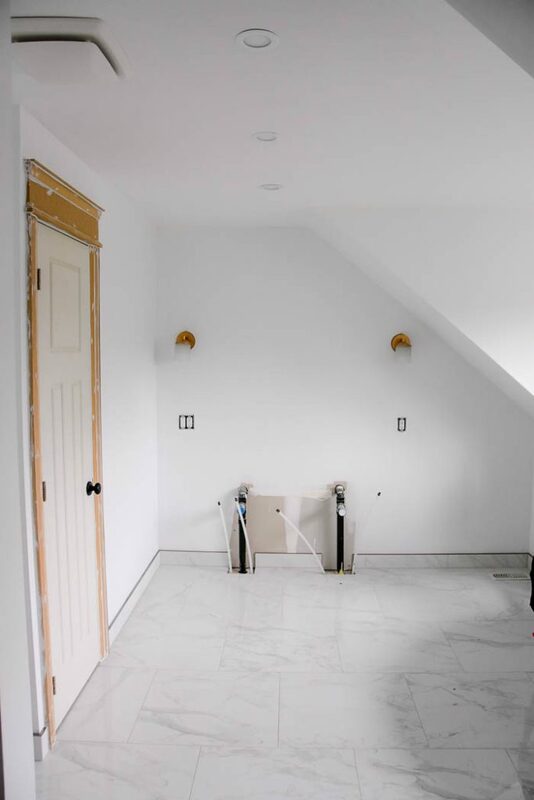 If you’ve been following on with our master bathroom renovation, you will have seen the before pictures and the faux-marble floor tiles that we went with. Well, we got the vanity area finished up a few days ago… and I’m dying. I love it SO.MUCH. We always planned for the vanity to go on this exterior wall in the bathroom. There was plenty of space for a double vanity and it was what you saw upon entering the room. #1: The biggest factor we had to take into consideration was that plumbing that you see coming up from the floor. 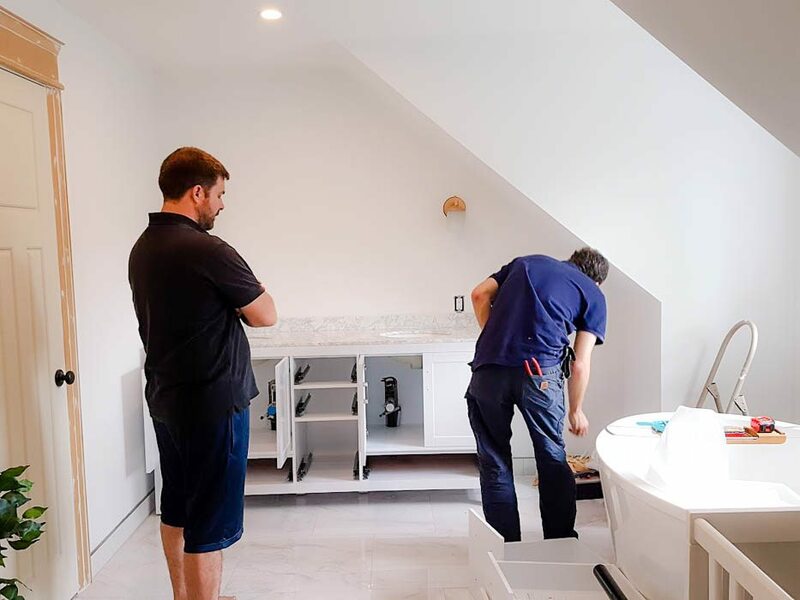 The plumbing had to be rigged like that for various reasons, which meant that we couldn’t go with a floating or open vanity because you would see the plumbing underneath. 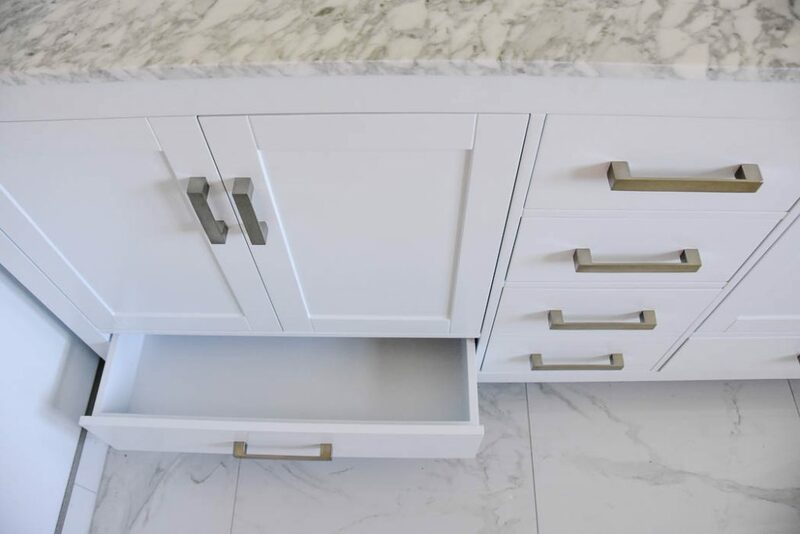 This limited our choices a fair bit, as so many of the more contemporary vanities out there are either floating or have a big open shelf along the bottom. #2: Secondly, I knew I wanted lots of storage. I like having some drawers, and also some cupboard space for taller items. 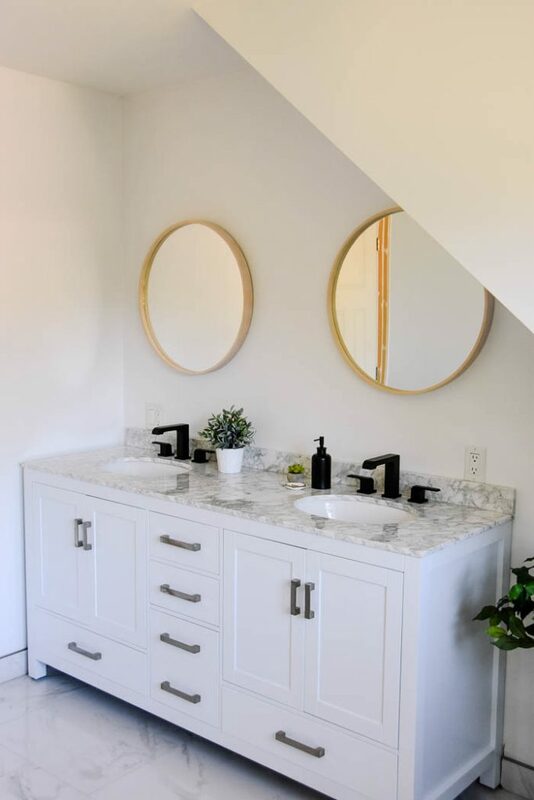 We also needed the vanity to be at least 65 inches wide, so that it would take full advantage of the space along that wall. #3: And lastly, I’m a sucker for classic white shaker cabinetry and carrara marble countertop. I knew if I could find the right vanity with those two features, I would be sold. 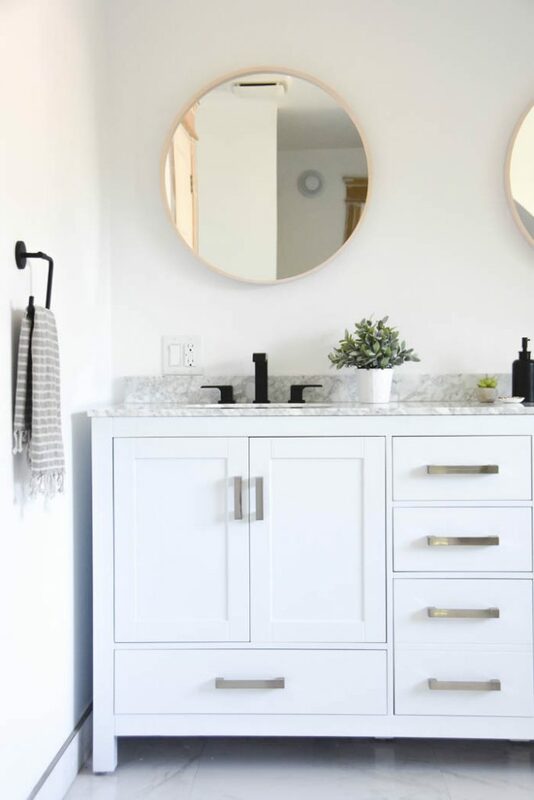 We toyed with the idea of trying to DIY the vanity somehow, but after looking into a few ideas, we realized that the costs started to really add up for such a big piece. And we were also just low on time, with so many other house projects on the to-do list. 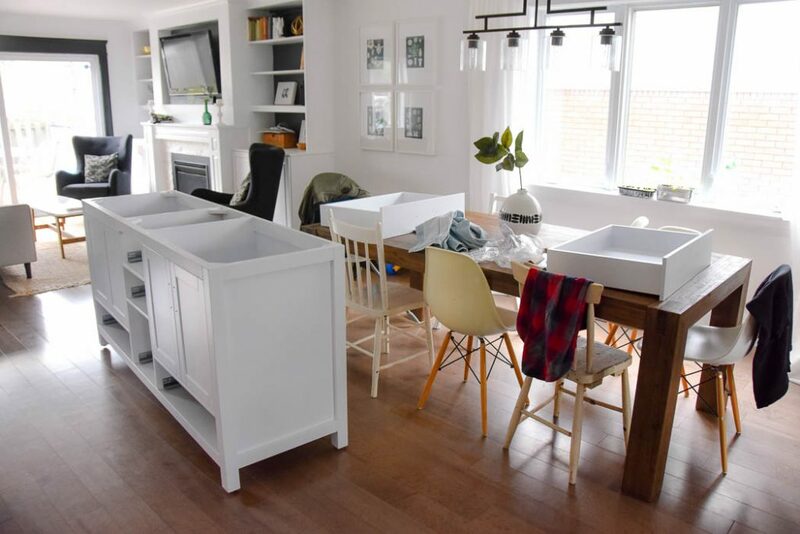 After tons of online searching, shopping around in local stores, and even going down the route of custom designing a vanity (which came out at over $4000 for even the “budget-friendly” materials, making us quickly trash that idea!! 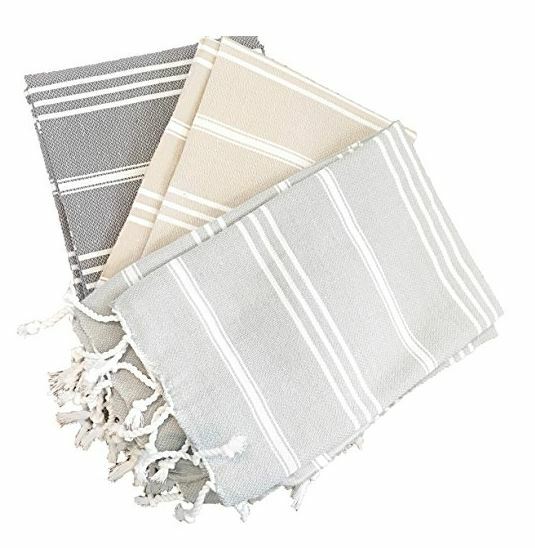 ), we finally landed on the Wyndham collection from Home Depot. We hadn’t been in a rush to tackle this room, so we were saving up for the vanity purchase and planned on tackling it in the winter sometime. Luckily though, I started chatting with the lovely folks from Home Depot and shared our design plans, and they jumped on board to sponsor the project. Cue the happy dance!! A few weeks later, the vanity arrived. 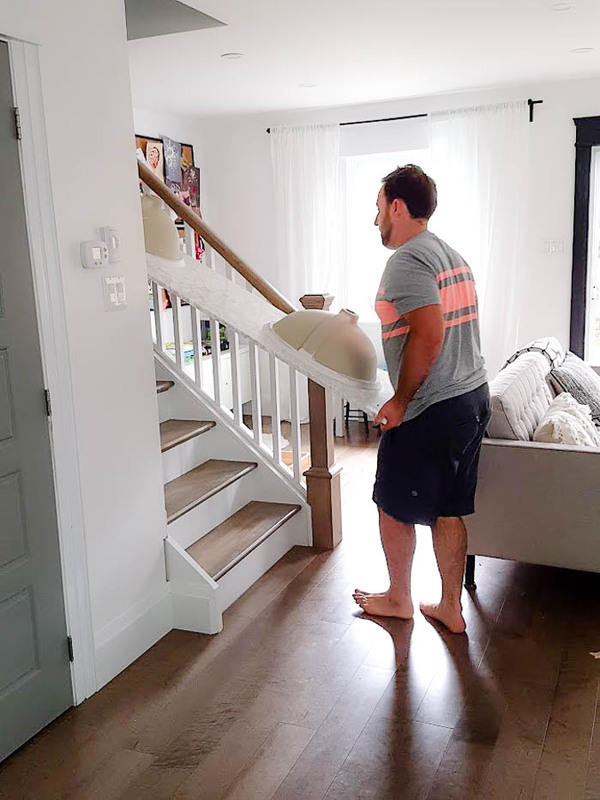 It took up some major real estate in our garage while we prepped the bathroom, and then we lugged this beauty into our dining room, and then upstairs. Hooray for brothers-in-law who live one street over to help with the heavy lifting (we owe you, Doug!). 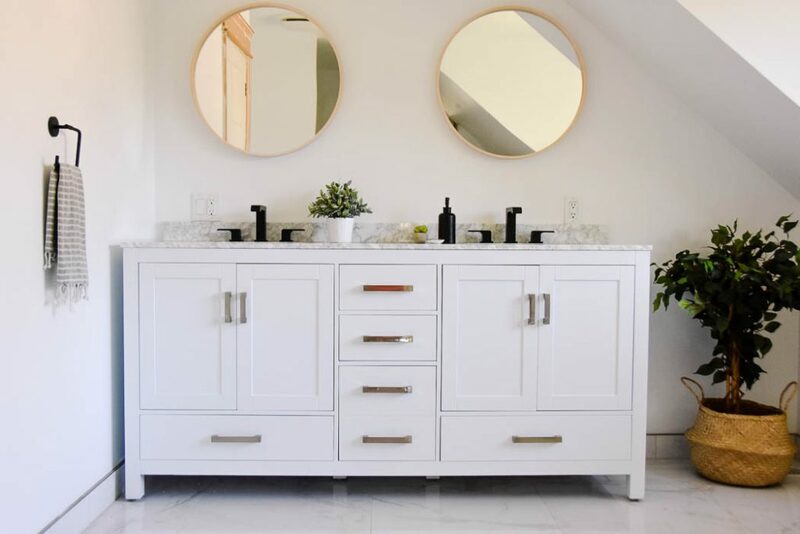 Dan installed the vanity with ease over the course of a day – it was very simple to put together. You can see in the photo above that we originally had two light fixtures installed when we were first renovating the house. 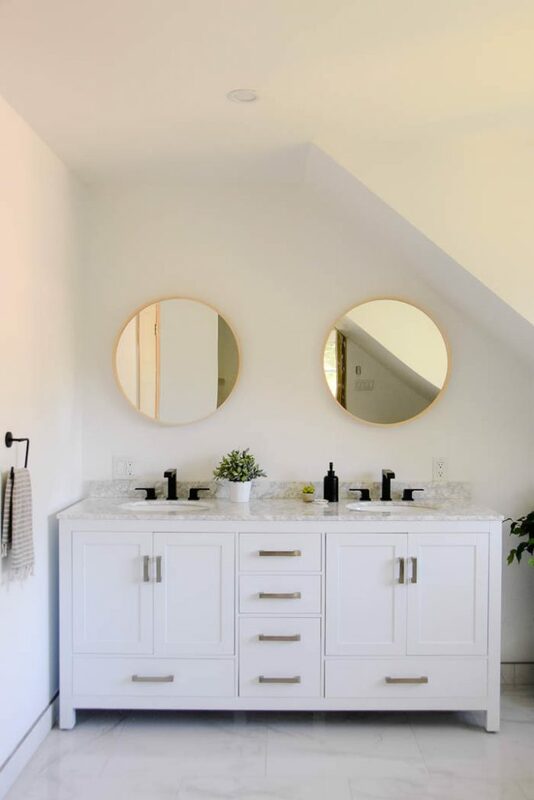 However, once we started planning the room, we realized that the placement of the two lights didn’t leave enough room to have a double vanity with mirrors on top of each sink. Instead of trying to move the electrical (which would have been complicated as it’s an exterior wall), we realized we didn’t actually need those light fixtures at all. We have great lighting from the potlights in the room, will soon have a hanging pendant near the bathtub. Plus, the room gets crazy sunlight streaming through the big window. 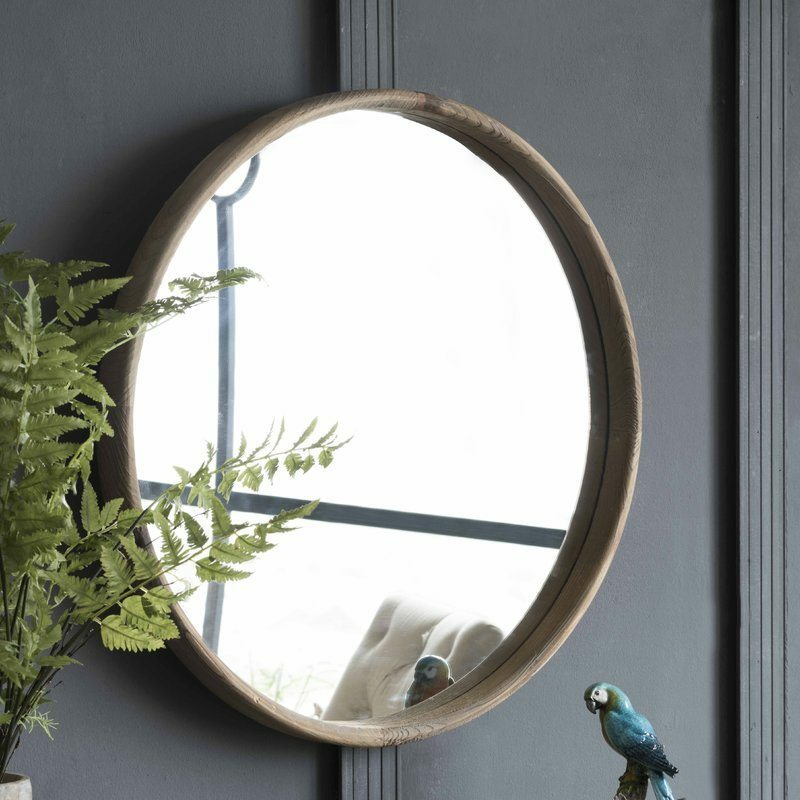 So to cover up our mistake, we purchased two round mirrors from EQ3 (they aren’t available online, but I found this wood one from Wayfair and this brass one from World Market that are really similar! ), and hung them above each sink. I love the light wood finish of the mirrors, which I plan on bringing in elsewhere in the room. We are really pleased with the vanity. The quality and craftsmanship is excellent. It’s a heavy, solid piece of furniture that just feels good. 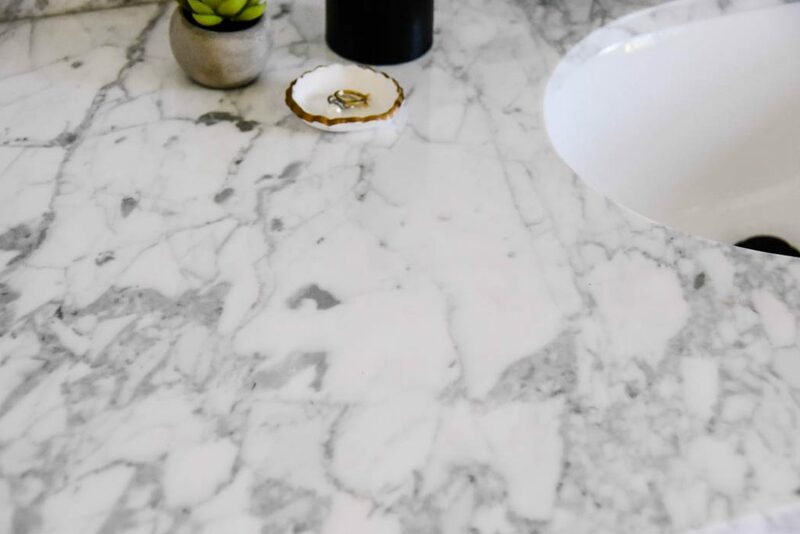 The carrara marble countertop has that cool marble feel and the veining is stunning. 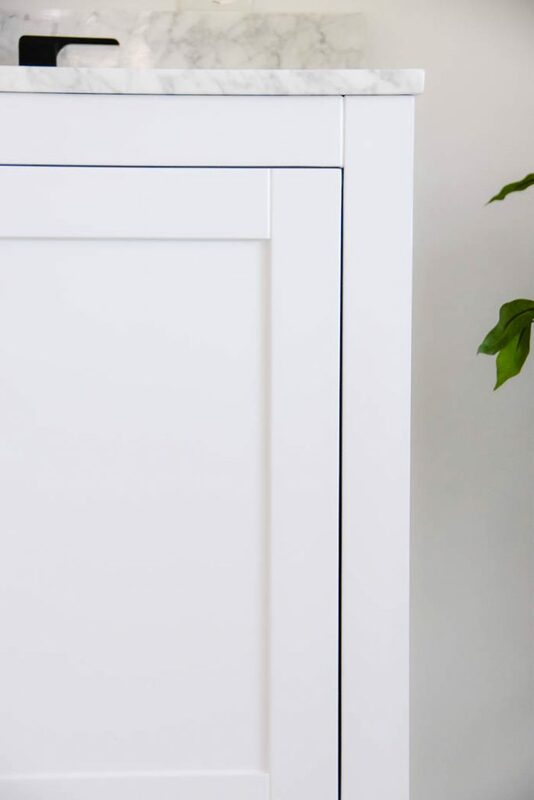 The shaker profile of the doors is somehow classic and contemporary all at once. 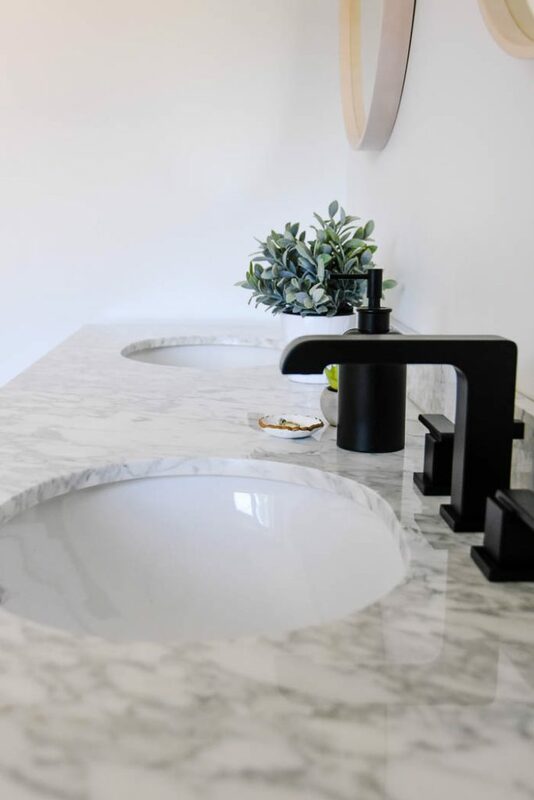 The other amazing thing about this vanity is that you get everything (except the faucets) with your purchase. Having the countertop, sinks, and pulls all included means you’re not running around trying to pull it all together. No hidden extra costs. 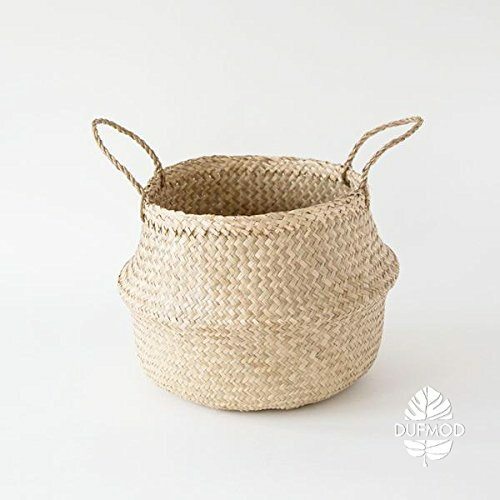 To fill the space next to the vanity under the sloped ceiling, I added this faux leaf tree from Wayfair for a bit of greenery, paired with a cute seagrass basket. Oh and the vanity drawers? Heaven. They are soft-close and we don’t even have enough stuff to fill them all up! A good problem to have. It was one of those spaces that I envisioned in my head, but was just keeping my fingers crossed that it would translate well in real life. You know how sometimes you can picture something but then it doesn’t actually come together the way you hoped it would? Well thankfully this space delivered. I need to finish the painting in the room (ahh, trim! my nemesis!). Then hang curtains and tackle the bathtub area. Oh and I’m still on the hunt for the right tile to use in our shower! 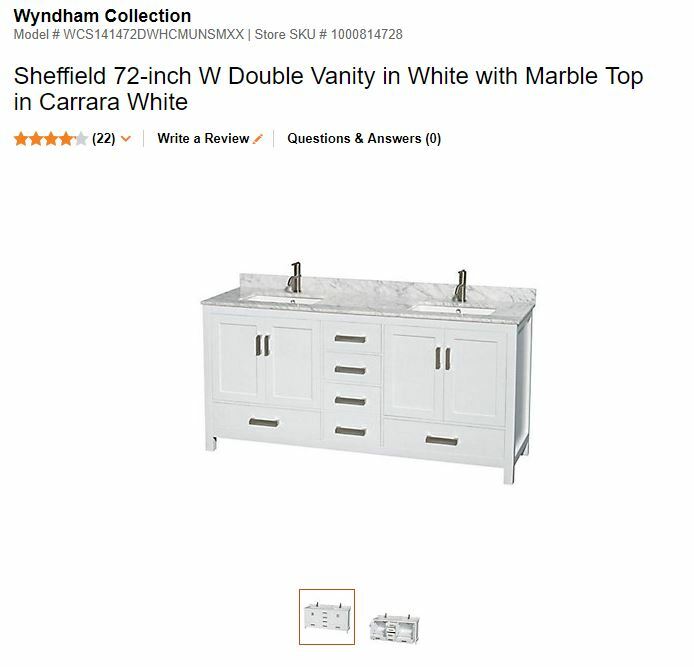 The Wyndham Sheffield bathroom vanity came from the Home Depot (here for Canadian; here for American), and you can shop the room accessories below! 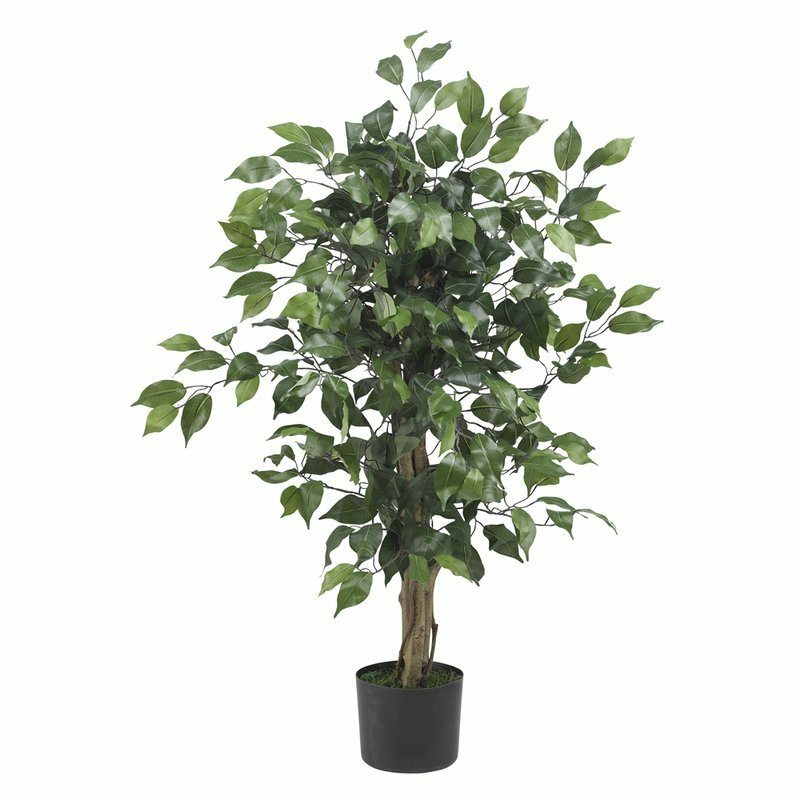 Disclaimer: This post has been sponsored by the Home Depot. We are huge Home Depot shoppers and could not have been more thrilled that they were interested in partnering with us on this project. All opinions are, of course, my own.